Corfe Bears > Charlie Bears > GLOBETROTTER 7"
Are you ready for teddy travels? It's always great to be able to take a bear away with you, but often they are just too big, so when you can't "bear" to be alone, this little bear is the perfect size for travelling with you, as he is only 7" (18cm) in size and comes with his own burgundy drawstring travel bag, which has 'Ready For Teddy Tarvels' printed onto it. Globetrotter is made from soft and cuddly cream and beige fur, with dark eyes, a black hand-stitched nose and mouth and stitched claws and wears a brown and cream checked tie. 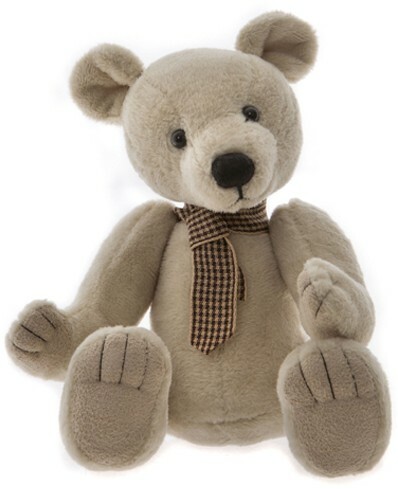 He could also be the perfect bear to give someone for re-assurance, or someone who needs a good luck bear to be kept with them during a hard time, or to remind them of the family they have left behind whilst at work, travelling, or at school/ university. Globetrotter is from the Charlie Bears 2019 Collection.